Over 14,000 reviews say you'll sleep better with Amerisleep. And our 100-Night Sleep Trial guarantees it — or your money back. We worked tirelessly to engineer a foam with the perfect balance of support and comfort, so you can wake up refreshed every morning. We call it Bio-Pur® and we know you'll love it. Forget waking up overheated and sweaty. Our carefully designed memory foam is engineered to wick away moisture so you rest comfortably all night long. No other memory foam is more breathable. Try our mattress risk free for 100 nights. If you don't absolutely love it, we'll give you a full refund and have a local charity pick it up from your home. 100% free. No need to keep the box or worry about shipping. Our sustainable production methods leave competitors trailing. We use plant based materials, and our manufacturing process produces zero emissions - it makes sleeping on memory foam a guilt-free pleasure. Amerisleep uses more materials proven to improve sleep than any other mattress brand. Our innovative and proprietary fabric and foam let us build the most comfortable mattress in the world. The result? Fewer interruptions while you sleep, less aches and pains in the morning. You can recover more efficiently and start your day feeling more refreshed than ever. And, with our 100 Night Sleep Trial, if you're not completely satisfied, we'll give you a full refund! More than 98% of owners report no heat related issues with their Amerisleep mattress. We've designed our mattresses for maximum breathability to help you stay cool and comfortable through the night. 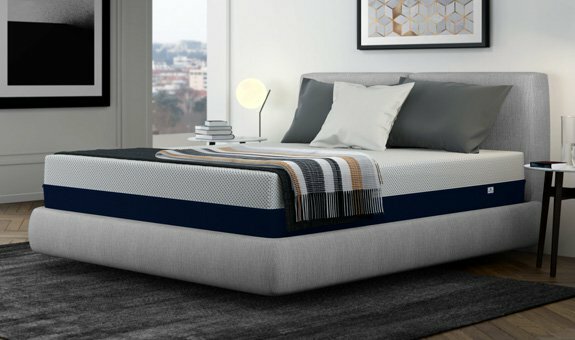 Our memory foam has a unique, open-cell structure that allows for better airflow within the mattress, helping keep your temperature even all night long. But remember, you have 100 nights to try it for yourself - if you don't love it, give us a call and we'll pick up the mattress and refund you completely! We guarantee that you will experience deeper, more recharging sleep on an Amerisleep mattress, or your money back. That's because all of the materials in our beds are expertly engineered, from cover to core. Our cover contains patented Celliant® fabric, which has special fibers that the FDA determined promote more restful sleep.2 They safely turn your body heat into infrared energy, which increases local blood flow to help you recover faster and wake up full of energy. Our mattresses are compatible with any appropriate frame, including each of Amerisleep's own range of adjustable and non-adjustable frames. Over 14,000 reviews, all written by real people and verified through a third party service. All featured customer reviews are unaltered and verified by PowerReviews (view disclaimer)4. "We absolutely love this mattress. I can't wait to lay down at night. No more stiffness in the in morning." "I love my Amerisleep mattress. I don't even need a pillow to find comfort in it. It is perfect." "This is the most comfortable sleep in my life. About to order another for vacation home." "Found out what the value of a good night sleep is... We are more than satisfied..."
"Excellent product as advertised. Delivered quickly. Great price." "Mattress is very comfortable. Great price, quick and easy ordering online. Easy setup." "If you need a good bed I would highly recommend Amerisleep. They are so honest and trustworthy..."
"We are very pleased with our Amerisleep mattress. It is extremely comfortable and provides great back support." "I have bought three mattresses from this company. Extremely happy with their service." 100-night sleep trial. No return needed. We're so confident you'll love your mattress, we're offering a 100-night trial, with no return necessary. Don't worry about shipping your mattress back, just let us know and we'll give you a full refund and arrange for a local charity to come pick up your mattress. You don't have to lift a finger, and your mattress goes to a good cause. We built a premium mattress. You get an amazing price. We built a high end mattress with amazing comfort and superior technology. Amerisleep is 100% direct-to-consumer, so you pay half the price of competing mattresses and get better quality. We know a side sleeper and back sleeper shouldn't use the same firmness, so we made 5 levels. Choose the firmness that's best for you. Not sure? Try our AS3 mattress, which is great for all sleep styles. Perfect for back and stomach sleepers looking for serious support. One of our most popular mattresses. Great for most people looking for comfy support. A great mattress for all types of sleepers. Great for side and combo sleepers that prefer a soft mattress that's still supportive. The ultimate in luxury. This is best for sleepers that want premium softness. Feel what it's like to sleep on a premium Amerisleep mattress today, 100% risk free. If you don't absolutely love it, we'll pick it up for you and donate it to a good cause. 2The FDA has determined that Celliant® products are medical devices as defined in section 201(h) of the Federal Food, Drug and Cosmetic Act and are general wellness products. Celliant® is determined by the FDA to temporarily promote increased local blood flow at the site of application in healthy individuals. Hologenix, LLC, the maker of Celliant®, states that Celliant® safely converts body heat to infrared energy. This energy penetrates into the muscle and tissue to promote a temporary increase in local blood flow and helps increase comfort and promotes restful sleep. 4 Reviews: All featured customer reviews are unaltered and verified by PowerReviews. The comments made by customers are not intended as advertisements, and should be understood as the perspective of each individual based on their experience. These reviews should not be construed to mean that these experiences are universal or that results will always be the same.